Nora Bibel was born in Munich in 1971 and has lived in Berlin since 1999. She travels often for her work, worldwide. She graduated in Photography from the University of Bielefeld and works as freelance artist and photographer. She also teaches photography in Berlin (Professor at HMKW Berlin and BEST-Sabel). She has exhibited internationally in group shows and solo exhibitions. A book project for Germany’s Federal Foreign Office led her to Vietnam in 2009 and sparked an intense period of travel and work in Asia. Her main focus there is the interplay and impact of social change and personal fates. © Nora Bibel Her portraiture and book project Que Huong (“Home”), which has been shown in Hanoi by the German Embassy as well as in solo and group exhibitions at several locations in Germany, documents how the concept of “home” changed for Vietnamese who returned to their homeland after living for many years as immigrants abroad. These are quiet, concentrated and precise images seemingly of everyday scenes yet in fact of staged moments quasi suspended in time, co-choreographed by the subjects. In early 2014, Nora Bibel was in Myanmar with a grant from VG Bild-Kunst to realise her project “Myanmar’s Driving Force,” in which she examined the effects of the country’s recent radical socio-political change on groups of individuals who played an active part in bringing about that change. 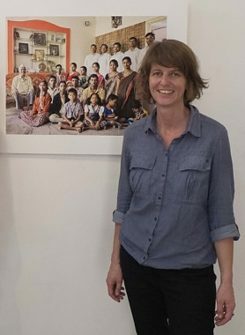 At the end of 2014, she was bangaloREsident@1 Shanthi Road and worked on a collection of Joint Family Portraits in Bangalore for her series: Family comes first. In India, the joint family is a sacred institution deeply rooted in Hindu heritage. Though extended families exist in most parts of rural India and some cities, joint families are harder and harder to find. But still, if you start to search for three generations under one roof, you will find a lot. 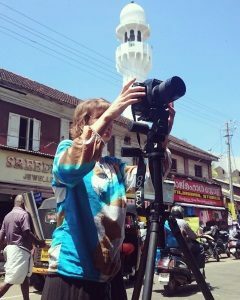 Nora Bibel is back on the invitation of the Goethe-Zentrum Trivandrum to explore the historic Chala Bazar in Thiruvananthapuram in its various manifestations and dimensions, and document these for posterity. Chalai Market was officially established towards the end of 18th century by Raja Kesavadas, Dewan of Travancore. Nowadays Chalai is still a busy place, but old houses are slowly disappearing and many family-run businesses in the third generation have closed down. Nora Bibel’s pics will try to stop the march of time. © Nora Bibel One and a half years had to go by until I was able to start the Residency in Thiruvananthapuram in Kerala, invited by Goethe-Institut Bangalore. So this time I knew beforehand what I had to expect from the concept of bangaloREsiden­cy and I was very excited to be part of it again. My project “Freezing Frames of Chala”, which I implemented this time, had its origins in a talk with Dr. Syed Ibrahim the director of the Goethe-Zentrum in Thiruvanantha­puram. In 2014 he suggested that I look at the wholesale market Chala. 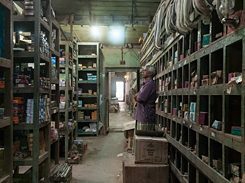 © Nora Bibel Chala Market was officially established towards the end of 18th century by Raja Kesavadas, Dewan of Travancore. The idea was to make Chala Bazar the central point of supply for commodities to the Travancore kingdom. The Killi and Kara­mana rivers nearby were used to transport goods to the market. 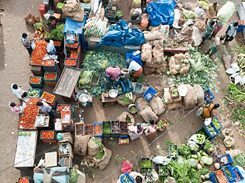 Today the market, which is spread over 2 square kilometres is still a busy place. There is virtually nothing that is not available in Chala, from fruits and vegetables, gold and silver to paint and hardware. But nowadays you can also see that old heritage houses disappear slowly and fa­mily-run business in the third generation are often closed down. The inhabitants of the city prefer the comfortable supermarkets and larger shopping malls. During my daily photo wanderings through the neighbourhood, I was accompa­nied by Anjali Gopan a young local photographer, who was introduced to me by my host the Goethe-Zentrum. She was a big help for the project and it would not have been possible to do the work without her assistance. © Nora Bibel Together we visited the hidden places of the market, especially empty rooms and buildings. By myself, I wouldn’t have been able to get access inside the houses of the family-run businesses and take photographs because only a few peo­ple who live and work in the bazar can speak English. With her sensitive manner, Anjali convinced almost everybody to pose and she waited patient­ly when I was in the process of taking a picture. My final presentation happened in the main road of the market which was my idea from the beginning of the project. I love the idea that the pictures of a project, first of all return to the place and the people where they were produced. After that, they can go on into a more artistic surrounding in a new size and form. Bobby Mohan, a designer working together with the Goethe-Zentrum, was a big help in realizing the street exhibition including the task of convincing everybody about the production of the presentation. Anjali Gopan The response to the street exhibition was amazing. It seems that Thiruvanant­hapuram has never had such an artistic presentation in public space. That really makes me happy. At all times during my stay I felt very well looked after by the Goethe-Institut and my host the Goethe-Zentrum. What was different from my last stay in Bangalore was that I didn’t have any contact or exchange with other residents. During my last stay, it was very inspi­ring to see how the other artists from different disciplines developed their projects. 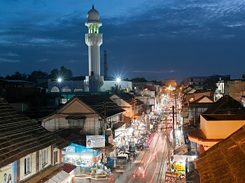 This time, being alone in Thiruvananthapuram, I had more intensive contact to local people and some good connections developed. I´m very happy that I could experien­ce both. Again, my time in India was incredibly productive and I worked a lot, which has been made possible by the well thought-out programme.